It seems like only yesterday that the 2012 World Series of Poker kicked off, but the hard reality is that while poker’s best have been locked away inside the Rio grinding tournaments on a daily basis, six weeks have passed by back in the “real” world. In that time, 60 bracelet events have come and gone, leaving us with just the $10,000 Main Event, which is already on Day 3. Throughout the weeks we’ve provided recaps of the most memorable poker hands from many of those events, and now it’s time for the biggest hands from Week 6 of the 2012 WSOP. We just watched what is probably the hand of the day thus far, one that appeared as though it would result in two eliminations with one card to come, but ultimately from which everyone survived. It began with Jonathan Hilton raising to 150,000 from middle position, leaving himself but about 80,000 behind. It folded to Martin Vallo on the button who reraised all in for about 670,000, then it folded to Daniel Eichhorn in the big blind. Eichhorn studied everyone's stacks, then announced he was all in, and Hilton called. "Just gimme a jack and a triple up," Hilton said. He got a jack all right — in fact, a couple of them — as the flop came to put him in front. But the fell on the turn, giving Eichhorn a Broadway straight. "Nice hand," said Hilton, having already accepted his fate. Then came the river… the ! A third jack, giving Hilton quads and Vallo a full house, meaning both survived. Hilton managed to use the momentum from that hand to grind his way to the final table where he nursed a short stack and watched Dominik Nitsche dominate his opponents. Eventually, Hilton found himself in heads-up action against Nitsche, and while he entered at a major chip disadvantage and ultimately finished as runner-up, he was no doubt thrilled that the allowed him to avoid the $32,682 payday associated with 15th place and collect a more appealing $405,156. Is Schulman the Best 2-7 No-Limit Lowball Player Out There? In 2009, Nick Schulman conquered a field of 96 in Event #23: World Championship No-Limit 2-7 Lowball for his first bracelet and a $279,742 payday. Last week, that particular event was held at the 2012 WSOP, the last on the schedule before the Main Event, and Schulman was back to prove the first time wasn’t a fluke. Mike Wattel folded his button, and George Danzer raised to 60,000 from the small blind. Nick Schulman thought for a moment, then three-bet to 180,000. Danzer tanked, then announced that he was all-in. Danzer showed , and was eliminated. Schulman shook Danzer's hand, and the German exited with his rail. Schulman went on to defeat Wattel in heads-up play, becoming the first two-time winner of the $10,000 2-7 No-Limit Championship, cementing his reputation as one of the best, if not the best, in that particular game, wile taking home $294,321 for his efforts. In the last hand at their table, action folded around to Terry Grimes on the button. He looked down at his cards and said, "Let's get this over with," before moving all in for well over 200,000. The small blind got out of the way, but Kevin Davis called off for nearly 200,000 from the big blind. Grimes was no doubt kicking himself after discovering he'd run into the granddaddy of all hands. The board ran out and Davis, clearly rattled on the hand, doubled to 394,800 on the last hand of the night. It’s conceivable that if Grimes had played it differently, he still could have lost a big pot, considering the flop was ace-high. That would prove especially true if Grimes held the , but, unfortunately, we weren’t able to catch that information. Nonetheless, that’s not how the hand played out and Davis received a welcome gift right at the end of the night. Only time will tell if he’s able to use it to make a run at the $8,527,982 first-place prize. The 2012 World Series of Poker National Championship was the culmination of a long 2011/2012 WSOP Circuit that rewarded 100 qualifiers from across the country by allowing them to fight for a $1,570,000 prize pool and the chance to play on national television. In addition, the 100 most prosperous players on the WSOP Player of the Year leaderboard were allowed the option to buy-in for $10,000. Last weekend, a field of 157 was whittled down to eight who returned Wednesday to play out the final table in front of the ESPN cameras. It was a big opportunity for the players, most of whom had never had the chance to enjoy the spotlight. Among them was recent bracelet winner and 2012 POY contender David “ODB” Baker, Circuit regulars Amanda Musumeci, Huy Nguyen and Yung “Andy” Hwang, all qualifying for the tournament through an At-Large Bid; WSOP Play of the Year qualifiers Sam Stein and Matt Keikoan; Harrah's St. Louis Casino Champ Nikolas Stone; and Caesars Atlantic City Main Event Champ Ryan Eriquezzo. Sam Stein started the hand by opening to 34,000 from the button and Huy Nguyen raised to 78,000. 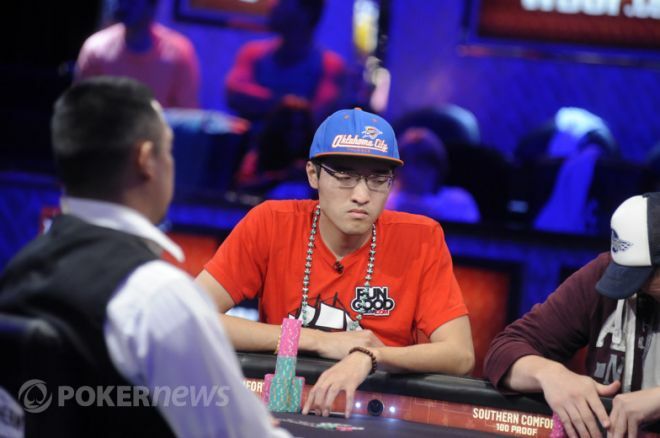 Andy Hwang took his time in the big blind and four-bet to 181,000. Stein folded quickly and Nguyen shoved. Hwang called and the hands were tabled. The flop came and Hwang had a huge lead with a set of aces. The turn came giving Nguyen a slim chance to draw to a straight. Then river card peeled off as giving Nguyen Broadway. Nguyen and Hwang are virtually even after the hand. That hand allowed Nguyen to escape a seventh-place finish, for which he would have earned $61,434, and he went on to take third place, worth a more satisfying $186,265.